BUDAPEST, Hungary -- Thousands of people seeking new lives in Europe entered Hungary on Tuesday, even as the government pledged renewed efforts to stop the human wave from the Middle East, Asia and Africa with a fence on the Serbian border. Outside the border village of Roszke, around 400 migrants were at a collection point at noontime (1000 GMT), waiting to be taken a fenced-in registration area nearby. Impatience among the migrants who had crossed over from Serbia was growing, as only two buses had been sent to get them since 6 a.m. (0400 GMT). At Budapest's Keleti train station, migrants were being allowed to board trains bound for Austria and Germany. In some cases, they were segregated from other passengers and told they could only enter the last carriages. Thousands of people seeking new lives in Europe entered Hungary on Tuesday, even as the government pledged renewed efforts to stop the human wave from the Middle East, Asia and Africa with a fence on the Serbian border. After a stand-off with Hungarian authorities last week that saw thousands of migrants trapped at Keleti and elsewhere, the travelers were greatly relieved when Germany opened its doors to the haggard and desperate people over the weekend. "We lost him in the forest. He went with another group. I don't know anything about him," she told The Associated Press before the boy was located. "Police in Hungary don't help. Everybody else helps. Not the police." Poland, which was so far agreed to accept 2,000 refugees, has been widely criticized for lacking solidarity with Germany, which has said it expects to take in 800,000 asylum-seekers this year and is able to absorb half a million per year for a few years. Poland's defense minister and deputy prime minister, Tomasz Siemoniak, defended his country's approach to the crisis on Tuesday and faulted the current European plan for not having developed a thought-out strategy to handle the crisis and for pushing for EU states to accept quotas of refugees. He called that a "road to nowhere" because it would only encourage more people to come. He also said that Germany should not feel it has the right to teach Poland about solidarity, given that Poland was the birthplace of the Solidarity movement, a mass movement that helped bring down communism in the former Soviet bloc a quarter century ago. "I think that our position is filled with solidarity and with the vision that we will not solve the problem with such summary, hasty decisions," Siemoniak said. In Hungary, Prime Minister Viktor Orban was quoted in Tuesday's edition of the pro-government Magyar Idok (Hungarian Times) daily newspaper as saying that he was persuaded to deploy more workers to finish the fence along the border after an unannounced inspection of the barrier on Monday with his chief of staff, Janos Lazar. The 4-meter (13-feet) high fence along the 174-kilometer (109-mile) border with Serbia was supposed to be completed by Aug. 31, but is facing delays. Defense Minister Csaba Hende, who was overseeing the construction, resigned Monday after Orban's visit. Now there are several coils of razor-wire stretched out along the whole border but it has been regularly breached by migrants, who usually crawl under it. The higher barrier is up only on some sections and no new completion deadline has been announced. 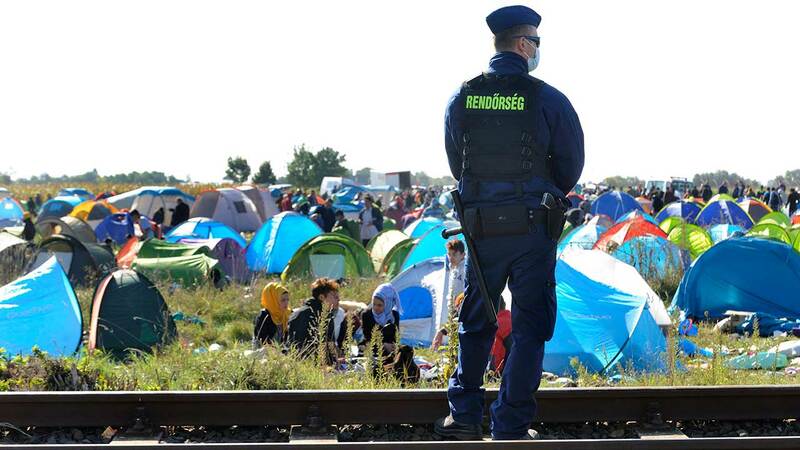 Hungarian police said Tuesday that they have detained more than 169,000 people for "crossing the border illegally" this year, including 2,706 on Monday. In Greece, the coast guard said Tuesday its patrol vessels picked up nearly 500 migrants in 11 search and rescue missions over the previous 24 hours in the eastern Aegean Sea. 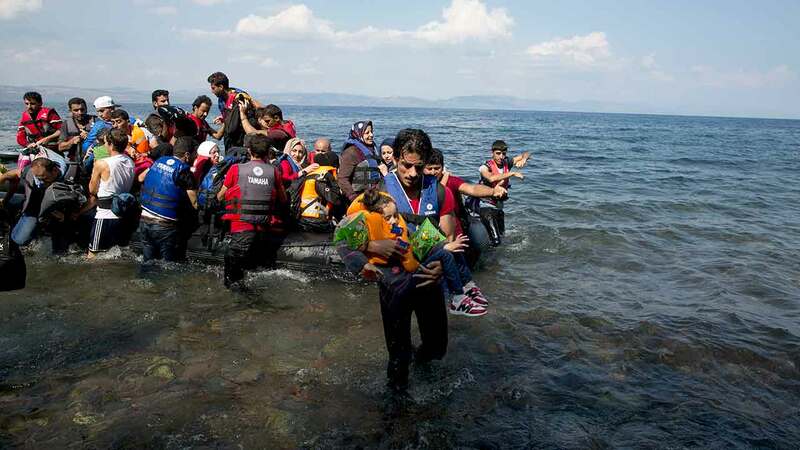 The people, whose nationalities were not immediately clear, were found in small boats near the islands of Lesbos - which accounts for nearly one in two migrant arrivals in Greece - Samos, Kos and the islet of Agathonissi. More than 15,000 refugees and migrants are stranded on Lesbos, awaiting screening before they can board a ferry to the Greek mainland - from where they head north through Macedonia, Serbia and Hungary to seek asylum in more prosperous European countries.